Gobble gobble, its time for floppin in NC. We still have some bear tags to fill at Nictau Lodge. We are headed up to Nictau Lodge with our friends to shoot some bears. Knocking down bucks in our home state of NC. Were shooting does and stingrays with a stick and string. We are headed down to Florida to shoot hogs in Osceola! We go back to Lamont Outdoors for late season. We go to Lamont outdoors for an IL rut hunt. We go to the land of OZ with 180 Outdoors to knock down a giant. Final Draw is based in the Piedmont of North Carolina but hunting season takes us all over North America. We head up to Kentucky for a week of great hunting and great fun. 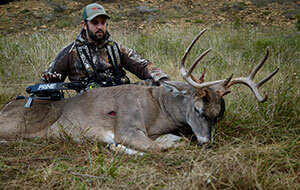 Final Draw is based in the Piedmont of North Carolina but hunting season takes us all over North America. Our team grew up hunting, fishing, camping, and taking advantage of all that God's creation has to offer. We don't always tag out, and sometimes we fall victim to bad shots or nerves, but we understand that the hunt lies in the preparation and not the product. We know what it takes to go from setting trail cameras, patterning, and planting food plots, to hanging stands, and spending hours upon hours waiting for that one perfect moment to pull that string back to your cheek and settle the pin. This is Final Draw: The American Outdoor Experience.